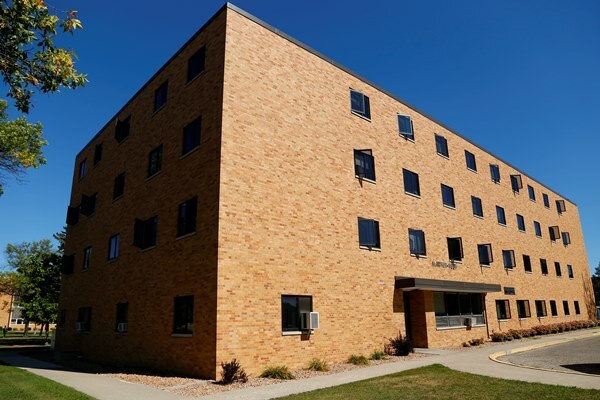 McArthur-Welsh Hall, known as "McWelsh," is located on the south side of campus, behind the Technology Center/MeWaldt-Jensen building. McWelsh is slated to be home to a learning community designed for NSU education majors. Due to its location near the center of campus, many sophomore, junior and senior students choose to reside here. The building honors Grace McArthur, a Northern music instructor from 1928 to 1966, and Emeline Welsh, an English professor from 1931 to 1966. Main lobby on the first floor has two TVs, microwave, piano area, pool table, table tennis and vending machines. TVs are located in the other lounge/kitchen areas, which are centrally located on the other three floors. Rooms have individual desks with desk lights, shelves and dressers on each side of the room; spacious closets; and full-length mirrors.